Strengthen and protect your nails while softening your hands with one of our popular manicures. 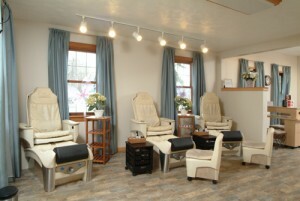 Includes traditional nail care, cuticle stimulation, massage, moisturizer and nail polish. Includes everything from the Coventina Manicure with an additional salt scrub for gentle exfoliation and warm towels for pampering. Includes everything in the Coventina Manicure plus an exfoliation treatment, hand mask and hand massage. Includes a moisturizing paraffin wax treatment. Shellac Hybrid Nail Color is similar to a nail overlay and can last up to 14 days without chipping. Dries in 4 minutes (which means goodbye smudging) and it can be removed just as fast without any damage to your natural nail. Strengthen and protect your nails while softening your feet with one of our popular pedicures. Includes eucalyptus soak, traditional nail care, massage and nail polish. Includes everything from the Coventina Pedicure with an additional salt scrub for gentle exfoliation and warm towels for pampering. Includes everything in the Coventina Pedicure plus an extensive exfoliation treatment, foot mask and foot massage. Includes a moisturizing paraffin wax treatment. Please request at time of booking as these services take additional time. Disclaimer: For the health and well-being of our clientele and staff members, Coventina Day Spa follows all State Board Guidelines and must refuse nail treatments to any clients believed to have a transmittable nail or foot condition.